Thank you so much for your financial support! Little by little, the channel for online donations is being used more and more often and we would like to thank the support of those of you who have helped financially the online citizen science projects of the Institut Català d'Ornitologia: Ocells del Jardins, Ornitho, Nius iOrenetes. Participation in the projects is the key to their success but keeping them running costs money and that's why donations are also very important. Thanks to all of you for your support! Aquest mes destaquem dues fotos d'una menjadora en un jardí de Sant Feliu de Buixalleu, comarca de la Selva, que sembla estar tan sol·licitada que els ocells l'han d'ocupar per parelles. En la primera d'elles un picot garser gros mascle comparteix l'espai amb una mallerenga blava que, a una distància prudencial, aprofita per obtenir també la seva ració de menjar. La segona combina un pica-soques blau amb un gafarró mascle en una altra menjadora al mateix jardí. Enhorabona a l'autora de les fotos, Matilde Londner, per tenir un jardí proveït de menjadores tan ben aprofitades! Gràcies a tots els fotògrafs per enviar tantes imatges! "La nostra selecció del mes", destaca alguna de les de les fotos d'OdJ que ens han cridat l'atenció. No és un concurs fotogràfic, així que no valorem la qualitat tècnica de la fotografia, ni tampoc hi ha cap premi. És senzillament una forma de destacar les fotos curioses que estem veient que obtenen els usuaris d'OdJ: comportaments particulars, difícils de veure, espècies poc habituals en jardins, menjadores farcides d'ocells i altres imatges que criden l'atenció. En 70 dies d'operació, la participació a OdJ ha assolit un bon nivell, tant en quantitat com en qualitat. En comparació amb els països on existeixen els projectes homòlegs, com França i Suïssa, estem assolint unes xifres que en proporció a territori i població aviat seran del mateix nivell. Anem guanyant en cobertura territorial però encara ens queden 11 comarques que sens dubte s'acabaran cobrint però és important que fem l'esforç per aconseguir-ho tan aviat com es pugui. Si encara no participes a OdJ, comprova si la teva comarca hi apareix [Estadístiques / Estadístiques de les contribucions / Distribució per comarca] i si no hi és et demanem que ens ajudis i comencis a informar d'ocells en algun jardí, públic o privat, de la zona. Encetem una secció, "La nostra selecció del mes", en la que volem destacar algunes de les fotos d'OdJ que ens han cridat l'atenció. No és un concurs fotogràfic, així que no valorem la qualitat tècnica de la fotografia, ni tampoc hi ha cap premi. És senzillament una forma de destacar les fotos curioses que estem veient que obtenen els usuaris d'OdJ: comportaments particulars, difícils de veure, espècies poc habituals en jardins, menjadores farcides d'ocells i altres imatges poc habituals. La nostra tria d'aquest mes de març és aquesta foto d'uns mosquiters comuns banyant-se al Parc de l'Espanya Industrial de Barcelona, de Gabriel Gallart. És una escena que, sense ser extraordinària, no veiem sovint en aquesta espècie. És també un comportament interessant d'observar quan ens el trobem perquè, si afinem la vista, veiem que el moviment de les ales i del cos està molt ben pensat per tal que l'ocell gaudeixi d'una bona dutxa per tot el cos.
As you know, as participants of OdJ you can enter sightings without having to establish a previous schedule or regularity. However, there two moments in the year that are special in this program: the last weekend of January and the last weekend of May. 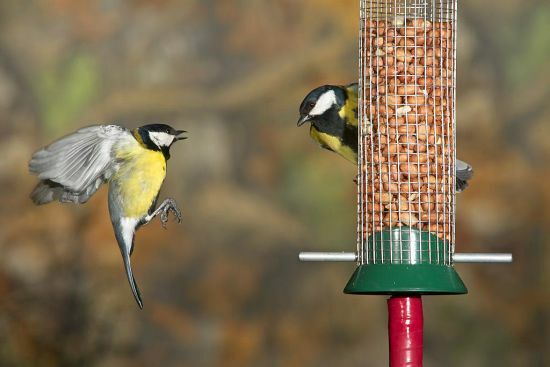 In these particular moments, you are specifically asked to count the birds in the gardens you manage. You may ask yourself if this is really important and what its purpose is. The answer is yes, it is VERY important. Counts over the year will provide us with information on feeding preferences, habitat selection, geographical distribution and a lot more of valuable information but the irregularity in the distribution of observations will make it more difficult to compare the information between areas where there has been a different sampling effort, particularly as far as bird abundance is concerned. Having two time points in the year in which all gardens have been surveyed will allow data analysts to obtain information that is more standardized (i.e., homogeneous, same effort, comparable) than the rest. This type of count will be useful to compare yearly variations in species abundance, which is very influenced by external factors such as rainfall, temperature, pollution, human activity and a long etcetera where, obviously, climate change also holds a place. To achieve this objective of standardization it is also important that you are rigorous in the control of observation time since time plays a very important role in the probability of detection of a bird, even if it is a common species. 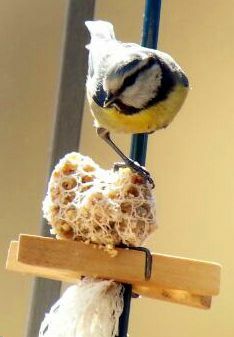 It is easy to understand that the probability of watching a particular species in our feeder will be higher if we spend one hour monitoring the feeder than if we spend just 10 minutes. It is simply a matter of likelihood. The next count will take place on the weekend of May 30th and June 1st. This will be the first spring count of the program. Remember to book the date to participate and have the privilege to be among the first ones! It's been for a month that OdJ is available to the birder community of Catalonia and the assessment is truly good, with a level of quantity and quality of participation that we can consider in the high end of what was expected. Access was opened on 1st February and on 5th there were 100 registered users! Afterwards, the number of participants has grown at an average rate of 2 users/day. During these first 30 days of operation, errors have been corrected, texts have been made available in Catalan, Spanish and English and several possible problems resulting from the greater massive use have been fixed. The computer platform has been fully tested in France and Switzerland and that's why technical problems have been virtualy non-existent. Consequently, the only incidents to point out have been the translation of all pages, options, menus, etc. since we started being aware that the translation to languages other than Catalan was not finished and that we would need to spend some time to complete it. Considering the short running time, these figures are pretty good. We hope to increase the number of contributors but we would like to increase particularly our territorial coverage. It is important to have gardens from the 41 comarcas of the country and to achive a greater coverage in less populated areas, since a substantial part of the observations are concentrated, obviously, in the areas where population is larger. Comparing to Ornitho, for example, in OdJ the bias towards more populated areas is much greater since gardens often represent the place where the observer lives, whilst Ornitho represents de places where the observer goes birding. We at the Institut Català d'Ornitologia want to express our sincere gratitude to all contributors and ask them, simply, to keep going this way. Welcome to Ocells dels Jardins! Maybe we are not aware enough that our private gardens, balconies, lawn patches and public gardens are a more important habitat for birds than what it looks like at first sight. Human presence in the territory is overwhelming and urban sprawl is so extensive that gardens, no matter how small they are, are oasis for birds. Their importance as a reservoir of biodiversity has been recognized in a number of scientific publications. But... to what extend? What birds take more advantage of this potential habitat? In what seasons? What kinds of gardens are more attractive to what kind of birds? Does it help to have feeders? If so, what birds are favoured most? Obviously, the list of questions is never-ending but what is clear is that we can answer those questions only if we have data. And we need lots and lots of data because urban habitats types are tremendously varied. We encourage you to join us to find answers to such questions. Ocellsdelsjardin.cat is a citizen science project in which any person with an interest to know our nearest birds can participate. In addition, not much birdwatching experience is necessary. The bird species that we can find in gardens are pretty easy to identify and the way data are input in ocellsdelsjardins.cat is very simple. In ocellsdelsjardins.cat you can input the observations of birds visiting your garden with a very simple methodology: only observation time and a control twice a year (winter and spring) are required. This is all you need to do. But you can input as much information as you want whenever you want! Your participation in the knowledge of our nearest birds is important. Thanks to you and to all other participants we will be able to know many issues we can't currently understand. Thanks to you we will know how our urban habitats can become less hostile for birds and make them become a real reservoir of biodiversity.